Lumbosacral spondylolysis (lumbar spondylolysis) is a unilateral or bilateral defect of the pars interarticularis that affects one or more of the lumbar vertebrae. See the images below. Radiograph of L4 defect in the pars interarticularis. Computed tomography scan demonstrating defects in the left and right pars interarticularis. When the defect in the pars interarticularis is not associated with a forward displacement, the term spondylolysis applies. 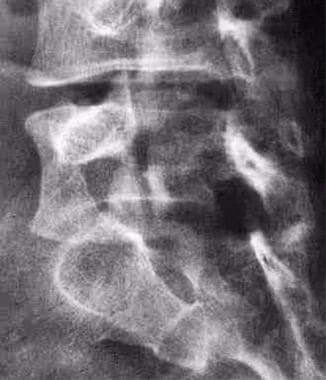 The term spondylolisthesis is derived from spondylos and listhesis, meaning movement or slipping, and refers to the slipping forward of one vertebra on the next caudal vertebra (see the image below). Lateral radiograph of the lumbar spine shows spondylolysis at L5 with spondylolisthesis at L5 through S1. On this single view, it is not possible to determine if these pars defects are unilateral or bilateral. Oblique views may help resolve this issue. For excellent patient education resources, see eMedicineHealth's patient education article Low Back Pain. Repetitive axial loading, especially in an extended lumbar spine is thought to be the most important contributing mechanism causing lumbosacral spondylolysis (lumbar spondylolysis), leading to fatigue fracture of the pars interarticularis. Shear stresses on the isthmic pars are greater when the lumbar spine is extended. When repetitive extension stresses occur, the pars interarticularis becomes impinged from the inferior facet of the cephalad vertebrae, which results in microfractures and attempts at repair. See the images below. Long TR (T2-weighted) fat suppressed sagittal magnetic resonance image shows increased signal in the pars interarticularis on the left at L5 (same patient in Images 3-4). This is an acute stress reaction. Sagittal short TR (T1-weighted) magnetic resonance image shows decreased signal in the pars interarticularis on the left at L5 (same patient in Images 3-4). Other sports with high incidence rates of lumbosacral spondylolysis (lumbar spondylolysis) are ballet, dancing, football, volleyball, and fast bowlers in cricket. In ballet, the higher incidence rate is due in part to an inability to reach or maintain proper turn-out and thus overcompensation with lordosis. Arriaza BT. Spondylolysis in prehistoric human remains from Guam and its possible etiology. Am J Phys Anthropol. 1997 Nov. 104(3):393-7. [Medline]. Morita T, Ikata T, Katoh S, Miyake R. Lumbar spondylolysis in children and adolescents. J Bone Joint Surg Br. 1995 Jul. 77(4):620-5. [Medline]. Aihara T, Takahashi K, Yamagata M, Moriya H, Tamaki T. Biomechanical functions of the iliolumbar ligament in L5 spondylolysis. J Orthop Sci. 2000. 5(3):238-42. [Medline]. Lonstein JE. Spondylolisthesis in children. Cause, natural history, and management. Spine. 1999 Dec 15. 24(24):2640-8. [Medline]. DeLisa JA, Gans BM, eds. Rehabilitation Medicine: Principles and Practice. 3rd ed. Philadelphia, Pa: Lippincott-Raven; 1998. 1646. Smith JA, Hu SS. Management of spondylolysis and spondylolisthesis in the pediatric and adolescent population. Orthop Clin North Am. 1999 Jul. 30(3):487-99, ix. [Medline]. Dubousset J. Treatment of spondylolysis and spondylolisthesis in children and adolescents. Clin Orthop Relat Res. 1997 Apr. 337:77-85. [Medline]. Albanese M, Pizzutillo PD. Family study of spondylolysis and spondylolisthesis. J Pediatr Orthop. 1982. 2(5):496-9. [Medline]. Stinson JT. Spondylolysis and spondylolisthesis in the athlete. Clin Sports Med. 1993 Jul. 12(3):517-28. [Medline]. Patel DR, Nelson TL. Sports injuries in adolescents. Med Clin North Am. 2000 Jul. 84(4):983-1007, viii. [Medline]. Sakai T, Goda Y, Tezuka F, Takata Y, Higashino K, Sato M, et al. Characteristics of lumbar spondylolysis in elementary school age children. Eur Spine J. 2016 Feb. 25 (2):602-6. [Medline]. Weiker GG. Evaluation and treatment of common spine and trunk problems. Clin Sports Med. 1989 Jul. 8(3):399-417. [Medline]. Liu X, Wang L, Yuan S, Tian Y, Zheng Y, Li J. Multiple-level lumbar spondylolysis and spondylolisthesis. J Neurosurg Spine. 2015 Mar. 22 (3):283-7. [Medline]. Ariyoshi M, Nagata K, Sonoda K, et al. Spondylolysis at three sites in the same lumbar vertebra. Int J Sports Med. 1999 Jan. 20(1):56-7. [Medline]. Commandre FA, Taillan B, Gagnerie F, et al. Spondylolysis and spondylolisthesis in young athletes: 28 cases. J Sports Med Phys Fitness. 1988 Mar. 28(1):104-7. [Medline]. Soler T, Calderon C. The prevalence of spondylolysis in the Spanish elite athlete. Am J Sports Med. 2000 Jan-Feb. 28(1):57-62. [Medline]. Congeni J, McCulloch J, Swanson K. Lumbar spondylolysis. A study of natural progression in athletes. Am J Sports Med. 1997 Mar-Apr. 25(2):248-53. [Medline]. Rossi F, Dragoni S. Lumbar spondylolysis: occurrence in competitive athletes. Updated achievements in a series of 390 cases. J Sports Med Phys Fitness. 1990 Dec. 30(4):450-2. [Medline]. Ralston S, Weir M. Suspecting lumbar spondylolysis in adolescent low back pain. Clin Pediatr (Phila). 1998 May. 37(5):287-93. [Medline]. Omey ML, Micheli LJ, Gerbino PG 2nd. Idiopathic scoliosis and spondylolysis in the female athlete. Tips for treatment. Clin Orthop Relat Res. 2000 Mar. 372:74-84. [Medline]. Harvey CJ, Richenberg JL, Saifuddin A, Wolman RL. The radiological investigation of lumbar spondylolysis. Clin Radiol. 1998 Oct. 53(10):723-8. [Medline]. Lowe J, Schachner E, Hirschberg E, Shapiro Y, Libson E. Significance of bone scintigraphy in symptomatic spondylolysis. Spine. 1984 Sep. 9(6):653-5. [Medline]. Bellah RD, Summerville DA, Treves ST, Micheli LJ. Low-back pain in adolescent athletes: detection of stress injury to the pars interarticularis with SPECT. Radiology. 1991 Aug. 180(2):509-12. [Medline]. [Full Text]. Collier BD, Johnson RP, Carrera GF, et al. 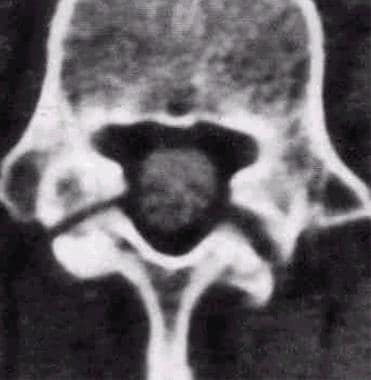 Painful spondylolysis or spondylolisthesis studied by radiography and single-photon emission computed tomography. Radiology. 1985 Jan. 154(1):207-11. [Medline]. [Full Text]. Elster AD, Jensen KM. Computed tomography of spondylolisthesis: patterns of associated pathology. J Comput Assist Tomogr. 1985 Sep-Oct. 9(5):867-74. [Medline]. Kalichman L, Li L, Hunter DJ, Been E. Association between computed tomography-evaluated lumbar lordosis and features of spinal degeneration, evaluated in supine position. Spine J. 2011 Apr. 11(4):308-15. [Medline]. Ulmer JL, Mathews VP, Elster AD, et al. MR imaging of lumbar spondylolysis: the importance of ancillary observations. AJR Am J Roentgenol. 1997 Jul. 169(1):233-9. [Medline]. [Full Text]. Sairyo K, Sakai T, Yasui N. Conservative treatment of lumbar spondylolysis in childhood and adolescence: the radiological signs which predict healing. J Bone Joint Surg Br. 2009 Feb. 91(2):206-9. [Medline]. Zehnder SW, Ward CV, Crow AJ, Alander D, Latimer B. Radiographic assessment of lumbar facet distance spacing and pediatric spondylolysis. Spine. 2009 Feb 1. 34(3):285-90. [Medline]. Dutton JA, Hughes SP, Peters AM. SPECT in the management of patients with back pain and spondylolysis. Clin Nucl Med. 2000 Feb. 25(2):93-6. [Medline]. Khadilkar A, Odebiyi DO, Brosseau L, Wells GA. Transcutaneous electrical nerve stimulation (TENS) versus placebo for chronic low-back pain. Cochrane Database Syst Rev. 2008 Oct 8. CD003008. [Medline]. Yuan J, Purepong N, Kerr DP, et al. Effectiveness of acupuncture for low back pain: a systematic review. Spine. 2008 Nov 1. 33(23):E887-900. [Medline]. Cherkin DC, Sherman KJ, Avins AL, et al. A randomized trial comparing acupuncture, simulated acupuncture, and usual care for chronic low back pain. Arch Intern Med. 2009 May 11. 169(9):858-66. [Medline]. Sertpoyraz F, Eyigor S, Karapolat H, Capaci K, Kirazli Y. Comparison of isokinetic exercise versus standard exercise training in patients with chronic low back pain: a randomized controlled study. Clin Rehabil. 2009 Mar. 23(3):238-47. [Medline]. O'Sullivan PB, Phyty GD, Twomey LT, Allison GT. Evaluation of specific stabilizing exercise in the treatment of chronic low back pain with radiologic diagnosis of spondylolysis or spondylolisthesis. Spine. 1997 Dec 15. 22(24):2959-67. [Medline]. Alfieri A, Gazzeri R, Prell J, Röllinghoff M. The current management of lumbar spondylolisthesis. J Neurosurg Sci. 2013 Jun. 57(2):103-13. [Medline]. Barbagallo GM, Certo F, Sciacca G, Albanese V. Bilateral tubular minimally invasive approach for decompression, reduction and fixation in lumbosacral lythic spondylolisthesis. Neurosurg Focus. 2013 Jul. 35 Suppl:Video9. [Medline]. Moeller JL, Rifat SF. Spondylolysis in active adolescents: expediting return to play. Phys Sportsmed. Dec 2001. 29(12):27-32. Buck JE. Direct repair of the defect in spondylolisthesis. Preliminary report. J Bone Joint Surg Br. 1970 Aug. 52(3):432-7. [Medline]. [Full Text]. Morscher E, Gerber B, Fasel J. Surgical treatment of spondylolisthesis by bone grafting and direct stabilization of spondylolysis by means of a hook screw. Arch Orthop Trauma Surg. 1984. 103(3):175-8. [Medline]. Scott JHS. The Edinburgh repair of isthmic (Group II) spondylolysis [abstract]. J Bone Joint Surg Br. June 1987. 69:491. Kakiuchi M. Repair of the defect in spondylolysis. Durable fixation with pedicle screws and laminar hooks. J Bone Joint Surg Am. 1997 Jun. 79(6):818-25. [Medline]. Wu SS, Lee CH, Chen PQ. Operative repair of symptomatic spondylolysis following a positive response to diagnostic pars injection. J Spinal Disord. 1999 Feb. 12(1):10-6. [Medline]. Chen JF, Lee ST. A physiological method for the repair of young adult simple isthmic lumbar spondylolysis. Chang Gung Med J. 2000 Feb. 23(2):92-8. [Medline]. Sales de Gauzy J, Vadier F, Cahuzac JP. Repair of lumbar spondylolysis using Morscher material: 14 children followed for 1-5 years. Acta Orthop Scand. 2000 Jun. 71(3):292-6. [Medline]. [Full Text]. Fellander-Tsai L, Micheli LJ. Treatment of spondylolysis with external electrical stimulation and bracing in adolescent athletes: a report of two cases. Clin J Sport Med. 1998 Jul. 8(3):232-4. [Medline]. Sward L. The thoracolumbar spine in young elite athletes. Current concepts on the effects of physical training. Sports Med. 1992 May. 13(5):357-64. [Medline]. Mannor DA, Lindenfeld TN. Spinal process apophysitis mimics spondylolysis. Case reports. Am J Sports Med. 2000 Mar-Apr. 28(2):257-60. [Medline]. Micheli LJ, Wood R. Back pain in young athletes. Significant differences from adults in causes and patterns. Arch Pediatr Adolesc Med. 1995 Jan. 149(1):15-8. [Medline]. Calmels P, Queneau P, Hamonet C, et al. Effectiveness of a lumbar belt in subacute low back pain: an open, multicentric, and randomized clinical study. Spine. 2009 Feb 1. 34(3):215-20. [Medline]. Caterini R, Mancini F, Bisicchia S, Maglione P, Farsetti P. The correlation between exaggerated fluid in lumbar facet joints and degenerative spondylolisthesis: prospective study of 52 patients. J Orthop Traumatol. 2011 Jun. 12(2):87-91. [Medline]. [Full Text]. El-Rich M, Villemure I, Labelle H, Aubin CE. Mechanical loading effects on isthmic spondylolytic lumbar segment: finite element modelling using a personalised geometry. Comput Methods Biomech Biomed Engin. 2009 Feb. 12(1):13-23. [Medline]. Helmhout PH, Harts CC, Viechtbauer W, Staal JB, de Bie RA. Isolated lumbar extensor strengthening versus regular physical therapy in an army working population with nonacute low back pain: a randomized controlled trial. Arch Phys Med Rehabil. 2008 Sep. 89(9):1675-85. [Medline]. Kalichman L, Kim DH, Li L, et al. Spondylolysis and spondylolisthesis: prevalence and association with low back pain in the adult community-based population. Spine. 2009 Jan 15. 34(2):199-205. [Medline]. Physicians' Desk Reference. 54th ed. Montvale, NJ: Medical Economics Co; 2000. Suh KT, Park WW, Kim SJ, et al. Posterior lumbar interbody fusion for adult isthmic spondylolisthesis: a comparison of fusion with one or two cages. J Bone Joint Surg Br. 2008 Oct. 90(10):1352-6. [Medline]. Wilms G, Maldague B, Parizel P, et al. Hypoplasia of L5 and wedging and pseudospondylolisthesis in patients with spondylolysis: study with MR imaging. AJNR Am J Neuroradiol. 2009 Apr. 30(4):674-80. [Medline]. Sagittally reconstructed computed tomography scan of the lumbar spine shows a defect of the pars interarticularis on the left at L5. Lumbar oblique radiograph showing the "Scotty dog." A pars defect is seen at L5.